Bentonite clay known as a healing clay is derived from aged volcanic ash. Bentonite clay powder found in India is brownish in shade and is found in Kutch region of Gujarat. 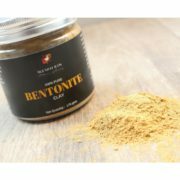 It is in the form of ultra-fine powder which is really soft in touch similar in texture to fine cake flour.When it comes in touch with water or any other liquid, Bentonite produces an electrical charge and swells making it absorb toxins , dirt and oil from the pores. . When applied on skin or scalp , bentonite clay can help heal wounds , clear up acne, clarify skin and reduce pain caused by bug bites by calming the skin . It also balances the excessive oil production during humid season. Not only can bentonite clay help to clear up clogged pores , it even leaves skin feeling softer , brighter and more supple. It works as a perfect detox mask after spending the day in sun or layering your skin with toxic makeup. 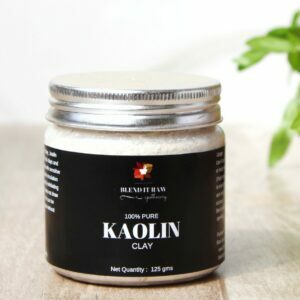 This clay can also be used on the scalp to clear up the scalp build up due to chemical laden shampoos and pollution , which in turn leads to healthier hair roots and faster hair growth. 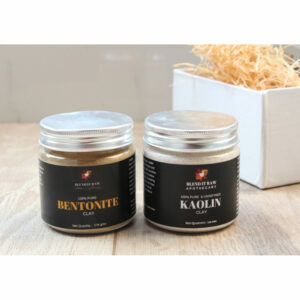 – All Natural, 100% Pure, Multipurpose Product: Blend It Raw Apothecary’s Bentonite Clay is a head to toe product. No additives, color, fragrance used ever! – Gets charged once it comes in contact with any liquid to attract dirt from the pores. detoxifies scalp, leading to healthier hair growth. Use it as a face, hair and body mask. Works best with Apple Cider Vinegar. This set will be perfect for you if you love making and using your own face/hair/body masks. Both these clays are suitable for all skin and hair types. This set consists of 175 gms Bentonite Clay and 125 gms of Kaolin Clay. -It is used to treat acne. -It can soothe itchy or dry skin during winters. – You can use it on your hair too. It is known to absorb any excess oil or dirt without stripping your hair of all of its necessary nutrients and promote hair growth. -Due to high amount of silica , it is effective in removing dead skin cells.